QVC in the next few weeks will introduce an in-app mobile feature that allows customers to make easy and quick purchases with just a touch of their finger. Using Apple’s fingerprint sensor technology, Touch IDTM, the QVC for iPhone app now gives customers the option to log in to their QVC accounts on all iOS 8-enabled iPhone 5S, 6 and 6+ mobile devices using only their fingertip to authenticate their identity. “Mobile remains our fastest-growing platform, and we’re continuously investing in new technologies and features that deliver a seamless and engaging customer experience,” said Alex Miller, QVC’s senior vice president of digital commerce. With the new Touch ID feature, QVC customers can shop through the QVC iOS mobile app using their fingertip. Following a one-time set-up, their billing, shipping and payment details will be automatically populated upon iPhone sensor authentication of their fingertip, enabling mobile shopping transactions on QVC to be completed with a single touch. Contributing to QVC’s mobile leadership, the company was an early adopter of responsive design, ensuring that it delivers a seamless customer experience across all platforms, regardless of the size of the screen on any device. The implementation of a responsive site capitalizes on consumers’ growing preference to browse and make purchases on their mobile devices. Mobile purchases accounted for 40 percent of QVC’s worldwide e-commerce orders in the second quarter of 2014. The just-released 2015 “Internet Retailer Mobile 500” revealed QVC is the third largest mobile commerce player among multicategory retailers. Recognizing that more and more viewers have tablets in hand as they tune in to QVC, the network recently added new functionalities to its QVC for iPad app to establish its necessity as a companion tool during QVC on-air programming. Fun and interactive features to validate and inform customers’ purchase decisions, including reviews and images. The QVC for iPhone app and QVC for iPad app are available as a free download in the App Store. The show, produced by High Noon Entertainment, returns Dec. 7 to The Weather Channel. The grand prize of the “$10,000 Prospectors Giveaway” includes rare aquamarine and bixbite gemstones that are valued at $5,000, along with $5,000 in cash. 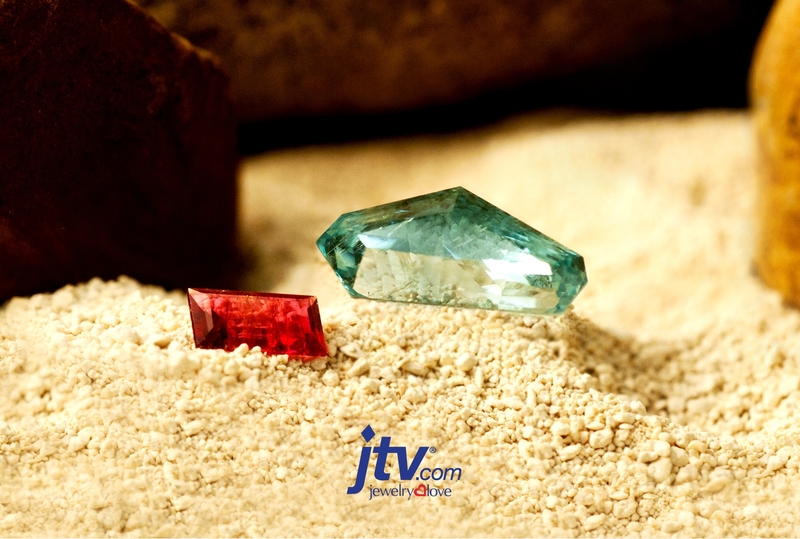 The aquamarine was unearthed from the mountains of Colorado by “Prospectors” cast member Amanda Adkins, who also makes frequent appearances on JTV as a gemstone expert. She will announce the winner during Season 3’s second episode Dec. 14. “Partnering with Jewelry TV is a natural fit given the ‘Prospectors’ audience’s passion for the amazing gems discovered in each episode,” said Scot Safon, executive vice president and chief marketing officer for Weather Co. “This sweepstakes gives this show’s fans the chance at their own windfall by winning an amazing souvenir from the show they love”. “Prospectors” follows a group of miners searching for the rarest gems in order to strike it rich. Season 3 brings back the original cast, along with a new family of miners, as they conspire on the mountains of Colorado to seek their fortunes. At 14,000 feet above sea level with 50 percent less oxygen, the prospectors must brave extreme environmental elements such as close-call lightning strikes, hurricane-force winds and dramatic temperature changes. For those willing to confront the danger, some of the planet’s most rare and precious gems await to be found, with huge paydays to accompany them. “Prospectors” is produced by High Noon Entertainment (“Dude You’re Screwed,” “Cake Boss”). The sweepstakes will be featured on The Weather Channel during on-air promotions, as well as on social media platforms and digital extensions, including the “Prospectors” show page. Viewers can now enter the “$10,000 Prospectors Giveaway”. We already blogged about Tyra Banks coming to HSN with a makeup line next month, but here is the home shopping channel’s official press release on her debut. Tyra’s fierce, new cosmetics brand, TYRA beauty, gives women the power to transform what they’ve got…into what they want. ST. PETERSBURG, Fla., Oct. 29, 2014 /PRNewswire/ — Tyra Banks, the world’s most influential supermodel and super-businesswoman, has teamed up with leading entertainment and lifestyle retailer HSN to deliver the world’s first live cosmetics extravaganza “Tyra’s Makeup Fierce Up”. The beauty spectacle will debut Banks’ one-of-a-kind makeup brand TYRA beauty on HSN that reaches an audience of more than 95 million homes. With her beauty secrets and secret beauty weapons, Banks is on a mission to transform the way the world experiences makeup through immersive ‘Beautytainment’—where beauty and entertainment collide. Banks will make her HSN premiere during a sneak preview on HSN’s popular “Beauty Report with Amy Morrison” show on Thursday, November 6 at 7 p.m. (EST). Banks will take viewers on a live behind the scenes peek of the elaborate backstage preparations for “Tyra’s Makeup Fierce Up”. 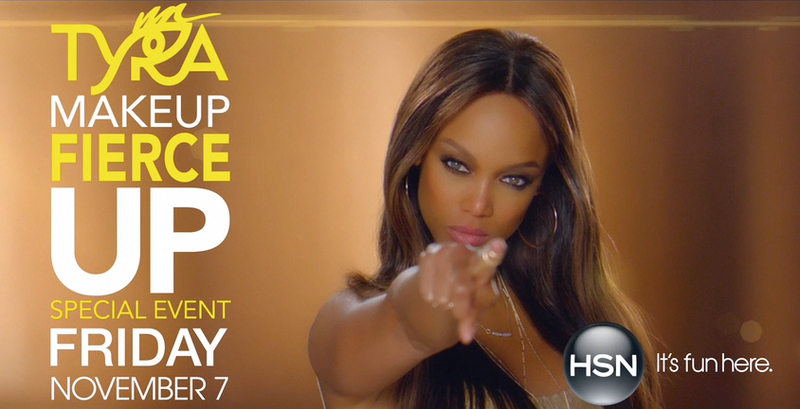 The following night in primetime on November 7 from 10 p.m. to midnight (EST), Banks and HSN will unleash “Tyra’s Makeup Fierce Up,” the live 2-hour cosmetics extravaganza that surprises, delights, and engages all of the senses by taking the audience on a bass-pumping journey of Beautytainment. Throughout the evening, HSN will leverage Banks’ mega-watt star power and beauty acumen to create a live beauty experience that has never been seen before. The show’s edgy and glam set design will feature state-of-the-art digital displays, dramatic lighting, and a fierce runway. Throughout the evening, Banks will unveil the story of TYRA beauty through live ‘TYovers,’ makeovers Tyra style, which will physically transform members of the studio audience, and makeup tutorials from Banks’ alter ego ‘Miss TyTy.’ The cosmetics experience will also feature elaborate costume changes and the first ever special performance of the TYRA beauty anthem BOOTYful, performed by Motown’s hottest new artist STORi. Inspired by Banks’ belief that makeup is the great beauty equalizer, TYRA beauty is fierce from the outside in, dripping with product and packaging innovation that engages all of the senses. The cosmetics experience launches with three high-tech pillars that each highlight a unique ingredient, story, or theme. TYover: The TYover pillar introduces easy-to-use products “in a Stick” for a fierce face…fast! Banks’ secret application technique called “Four Fast Fierce Fingers” creates a complete transformation in six minutes or less without the use of a brush! Through Banks’ proprietary ‘TY-Glide Technology,’ the silky smooth application and easy blendability will have women werkin’ their fiercest faces, Tyra-style. Smize: The Smize pillar offers new technologies to create the fiercest “Smize,” one of Banks’ famously coined words that means, “smiling with your eyes.” With rich products exclusively for the eyes, every woman can tantalize with the fiercest Smize! It Factory: The It Factory pillar provides a mix of runway-inspired cosmetics infused with unique textures and innovative formulas. These products will surprise and delight a woman’s sense of touch, starting when she applies her fiercest lip! We hear that Jewelry Television is losing another young host, Kristen Keech. Keech, who has been at JTV for four years, was recently on vacation in Miami and got a sweet job offer. It’s apparently a gig on cruise ships. 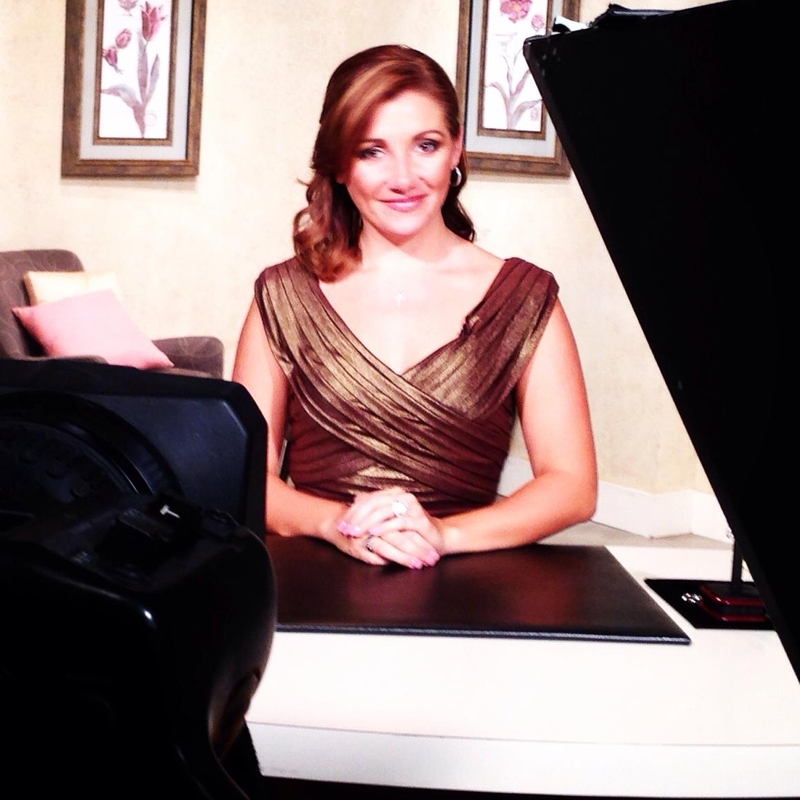 We like Keech and thought she was a fresh face on the Knoxville home shopping network. Let’s see who JTV brings in to replace her. Kristen Keech was born and raised in Pennsylvania and began her performing career at age three. With years of music, theatre and commercial experience, Kristen crossed over into the broadcast arena while in college. Before graduating college she began working in on-air retail with another company, both on camera and behind the scenes. The day she set foot in the studio she knew that this is what she was going to do for the rest of her life. To Kristen, the most rewarding part of being a show host is having the opportunity to spend time with families all over the country. The ability to be welcomed in to a viewer’s home and to be afforded the opportunity to spend time with them is a gift beyond explanation. She believes that a show host’s job is all about the connection and relationship with the customers. She says that she is honored and blessed to be able to have such great relationships with so many wonderful people. Keech is also apparently a talented equestrian. Jewelry Television has something new up its sleeve, by launching a “Gem of the Year” initiative based on crowdsourcing, the network said Tuesday. The public is invited to vote for one of three of the network’s most popular gemstones between Oct. 28 and Nov. 9. We, by the way, are not fans of any of the three jewels. JTV gemstone buyers, gemology experts, and merchandisers (and not The Homeshoppingista) “have narrowed the field to three top-performing gemstones representing the crème de la crème in terms of beauty, rarity, and desirability,” according to the home shopping channel’s press release. Chrome Diopside – sometimes known as Tashmarine, this gemstone color varies slightly from vivid green to a bluish green or even a yellowish green. Often mistaken for an emerald, this gem is primarily from Siberia, Russia. Morganite – a variety of beryl, is a pink, salmon pink or slightly purplish pink stone and a cousin to other beryls such as emerald and aquamarine. Named after financier and gem enthusiast J.P. Morgan, Morganite’s pinkish hue comes from the presence of manganese. Tanzanite – a relatively new gemstone in the world of gemology and jewelry, Tanzanite’s blue, violet blue or bluish purple shades are brilliant. This single sourced gemstone from Tanzania is a thousand times more rare than a diamond. Each voter will be automatically entered to win a trio of jewelry designs in chrome diopside, morganite and tanzanite. “We value the opinion of gemstone enthusiasts everywhere and are excited to create an exciting new tradition in the world of gemology,” Johnson said. We won’t be watching, since we don’t cook, just eat, but HSN will have a 24-hour “Cooks” event Nov. 2, featuring network newcomer Robert Irvine, cronuts and either El Gordo or La Flaca, we’re not sure which. There will be a live audience, of guess who? HSN Credit Card customers. These folks should get a free show, they are paying an exorbitant interest rate on that plastic. In addition to Irvine, “Iron Chef” judge and Zagat’s “Hostess with the Mostess” Donatella Arpaia will offer recipes for live on-air fun from 2 p.m. to 3 p.m.; and celebrity chefs and restaurateurs Ming Tsai and Lorena Garcia will appear together from 3 p.m. to 4 p.m.
Cronut connoisseur Dominique Ansel will also be on-air demoing delicious recipes from his first-ever cookbook, “DOMINIQUE ANSEL: The Secret Recipes” (Simon & Schuster Hardcover), launching on HSN. Ansel shares the secrets of transforming humble ingredients—flour, butter, sugar—into the most tempting and satisfying pastries imaginable. Also launching a new cookbook, “Chopped” judge and “The Next Iron Chef” winner, Geoffrey Zakarian, will be appearing on-air demoing recipes from his much anticipated, “My Perfect Pantry” (Clarkson Potter Hardcover). Foodies everywhere can shop both of these celebrated cookbooks, of which autographed versions will be available for sale. “Top Chef Duels” most recent winner, CJ Jacobson, will be making an appearance during the event. New to HSN’s “Cooks” event, co-host of Univision’s “El Gordo y la Flaca,” Raul de Molina, will be a special on-air guest host and lifestyle contributor. De Molina will be interacting with the celebrity chefs and guiding shoppers through the international fusion of recipes that will be prepared during the live audience portion of the event. HSN unveiled its holiday-season programming lineup Wednesday, and the debuts will include a makeup line by ex-model/TV personality Tyra Banks — as well as a Rolling Stones-themed fashion collection and “Happy” the HSN holiday bear. On Nov. 7 from 10 p.m. to midnight, Banks, will launch her new TYRA beauty makeup collection during “Tyra’s Makeup Fierce Up,” a two-hour primetime special. There will also be another debut, that of TV chef and host of his own cooking show, Robert Irvine. He will launch his line of culinary tools and accessories during the “HSN Cooks” event Nov. 2. And in a new idea, HSN will celebrate more than 50 years of The Rolling Stones Nov. 13 with a first-ever fashion collection featuring Mick Jagger and Keith Richards’ legendary lyrics, designed by Diane Gilman, R.J.Graziano, Carlos Falchi and Lyric Culture. And there will be several memorable returning vendors at HSN. Nicole “Snooki” Polizzi of “Jersey Shore” fame will be back at the home shopping network. Snooki, by the way, will soon be getting married and having her wedding reception at The Venetian in Garfield, N.J. — the same venue where our friend Patty’s nephew had his post-nuptial shindig. 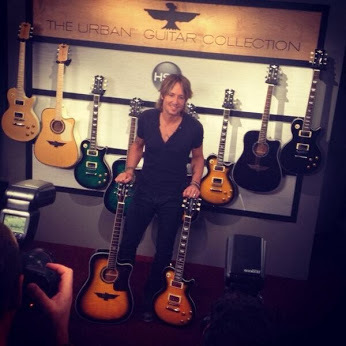 And one of our favs, four-time Grammy Award-winner and Nicole Kidman hubby Keith Urban, will celebrate his first anniversary with HSN with the launch of his limited edition “Star Fire” 22-Piece Guitar Package Nov. 15. In a new gimmick, HSN will be hosting special Black Fridays on Nov. 7, 14 and 21. * Nov. 7 – A “Bundles at their Best” themed day offers shoppers the opportunity to buy featured bundled items, BOGOs, and Bonus Buys. * Nov. 14 – With themes like “Basics with a Flair” and “What’s Old is New Again,” shoppers can take a trip down memory lane with nostalgic throwback pieces and gift ideas from home, electronics and more. * Nov. 21 – Shoppers get full access to a day of “Stocking Stuffers” with gifts under $100, $50 and $25. And 10,000 customers will receive a complimentary holiday stocking when purchasing special stocking stuffer qualifying items throughout the day. On Thanksgiving Day, “Happy” the HSN Holiday Bear will make its debut, with HSN donating 1,000 bears to charity for the first 1,000 bears sold. Later that night through Black Friday, HSN will offer “doorbuster” bargains ranging from name brand electronics to handbags and jewelry. Is Mary Campbell The New Claire Watts At QVC? QVC has promoted Mary Campbell to Executive Vice President of U.S. Commerce Platforms, reporting directly to QVC Inc. top banana Mike George. We asked QVC, and never got an answer, as to whether Campbell is the replacement for Claire Watts, the QVC U.S. CEO who abruptly exited the channel in September. It sounds like Campbell is, and if so, it sounds like another case where a woman gets a promotion but doesn’t get the title she really deserves. Just sayin’. Wednesday’s press release said that Campbell is responsible for guiding the strategic direction of the company’s TV, web, mobile, tablet and social while translating the QVC brand across all platforms to drive customer engagement and e-commerce sales. QVC’s mobile commerce business has grown steadily year over year, currently accounting for 37 percent of U.S. e-commerce revenue in the second quarter 2014. Additionally, QVC is the third-largest mobile commerce player among multicategory retailers according to the 2015 Internet Retailer Mobile 500. Since joining QVC in 1991, Campbell has held leadership roles across the business, including Merchandising, Planning and Commerce Platforms. In her most recent role as senior vice president of commerce p\Platforms, Campbell led the expansion of QVC’s broadcast by launching two new TV distribution channels, over-the-air and QVC Plus. QVC Plus, which now reaches 47 million homes, offers the same programming as the main QVC channel with a three-hour delay along with unique live and pre-produced programming. Campbell was also instrumental in enhancing QVC’s digital experience through the creation of the company’s first social shopping community, toGather, the redesign of the QVC for iPad application, and the implementation of responsive design for QVC’s website. Campbell will continue to be based at QVC’s global headquarters in West Chester, Pa. The pure-play tracking stock for the QVC Group is now trading on NASDAQ under the ticker symbols “QVCA” and “QVCB,” respectively. QVC’s parent, Liberty Interactive Corp. (“Liberty”) (Nasdaq: QVCA, QVCB, LVNTA, LVNTB), has recently realigned Liberty’s businesses to create a pure-play retail tracking stock that will track the performance of QVC Inc. and Liberty’s roughly 38 percent interest in HSN Inc., as well as cash and certain liabilities, and the tracking stock group formerly known as the Interactive Group is now known as the QVC Group. The QVC Group tracking stock allows investors to more closely track QVC’s strong performance, including its leadership in mobile ecommerce and its visionary innovations that provide customers with a seamless, integrated shopping experience across all digital platforms. It also provides greater clarity and visibility into QVC’s operational and financial results, according to a press release. “QVC has emerged as a clear leader in the retail space,” QVC President and CEO Mike George said in a canned statement. QVC will once again join partner with Lifetime’s “Project Runway All Stars” to take part in the fourth season of the design competition series, the home shopping network said Tuesday. The channel will will sponsor the show’s accessory wall, which designers are able to pull from during each challenge to enhance their designs. There will also be a special QVC challenge for the contestants, and the season’s grand-prize winner will have the opportunity to create a collection especially for the retailer. “Last year’s collaboration with Lifetime’s ‘Project Runway All Stars’ proved to be extremely successful in expanding QVC’s brand prominence and exposing a new audience to our shopping community,” said Karen Fonner, QVC’s vice president of content marketing. “We’re excited to team up with this popular series for a second year and have the opportunity to once again highlight our impressive offerings while reinforcing QVC as a retail destination for the latest fashions,” Fonner said. This year during the QVC challenge, contestants will have to create a look for the QVC line G.I.L.I., with the top designer winning the opportunity to present a version of their design on QVC. Following the season finale, the grand-prize winner of “Project Runway All Stars” gets the chance to create a capsule collection for QVC and present their line on air during a live broadcast. Last year’s champion, Seth Aaron Henderson, found success in his popular collection and has since continued to build his QVC business with his fashion line, SA by Seth Aaron. The fourth season of “Project Runway All Stars” will air on Lifetime beginning Oct. 30 at 9 p.m.
QVC plans to promote the program through its various social platforms, as well as on its website and mobile applications. Multimedia content will feature behind-the-scenes footage and information on the designers and challenges. Viewers will also be able to purchase items from the QVC accessory wall, plus pieces inspired by the show’s weekly challenge. For more information about QVC’s involvement with the series, visit qvc.com/ProjectRunwayAllStars. Tags:", "Project Runway All Stars", Karen Fonner, Lance Still, Lifetime, QVC, Seth Aaron Henderson, The Homeshoppingista, Weinstein Co.
You are currently browsing the Homeshoppingista's Blog By Linda Moss blog archives for October, 2014.